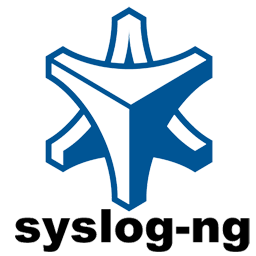 I am going to do a simple install of syslog-ng on Ubuntu 16.04 and do a little setup to capture some logs. I am going to output some example logs using a simple python program. system() will look at what it considers system locations. If you look down a little further in the page you will see this. For a linux system this will look at /dev/log a socket. Looking around you will find a line with "filter f_sylog3" in it. Message have to pass all filters to go on to the destination. So in this case the log cannot be a auth, authpriv, or mail type. Whose numerical codes are 4, 10, 2.
f_debug refers to another filter in the same file and here it is. Here we again see the not facility but this time it has news. So I guess we really did not need this part in the first filter as it was in the nested filter. … oh wait the first one does a not on this so it's an inverse of this filter… duh! So in this case it must be a debug level in order to pass this filter. Looking around you should find this. Here are the other pieces it references. Is there a simple way to echo a log to /dev/log as a test? I am going to just try a simple python programing using their logging system. Here are my results after running it twice. You cans see that I got the INFO and the ERROR but the DEBUG was filtered out . I am going to make a new setting to send this type of log file to a new location. I am using the same source as before s_src which will listen to /dev/log in my case on linux. 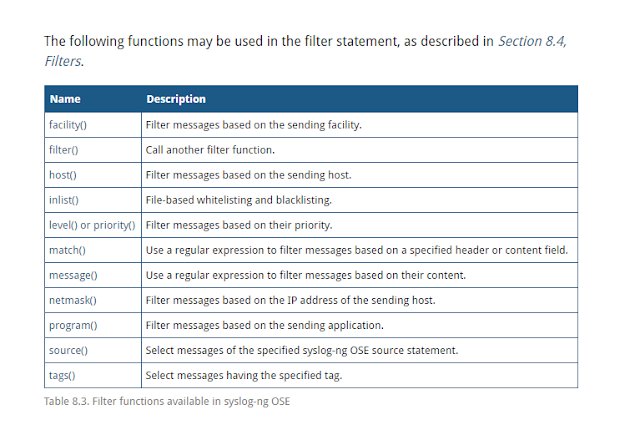 This says filter only those that are sent to facility local0 which is what I am doing in the python code. Tailing the /var/log/syslog I see an error! Looks like it took that time. I see nothing! The file is not auto created… What am I doing wrong? Reloaded and ran my test and it worked! So what is wrong with my filter? A few more test and I found out it's my code the filter is fine as is. Running a quick test in my python code. Now tail the new file and run the command. There we go we are getting logs now. 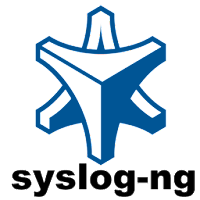 Syslog-ng does not do anything about log rotation. For that job I am going to set up logrotate. If it's valid you should see details of your rotation. Here you can see it rotates after 1 day and keeps 15 rotations. There is no need to restart any service as during the next run it will pick up the changes it finds. You can force the run of it to confirm its output with this command. 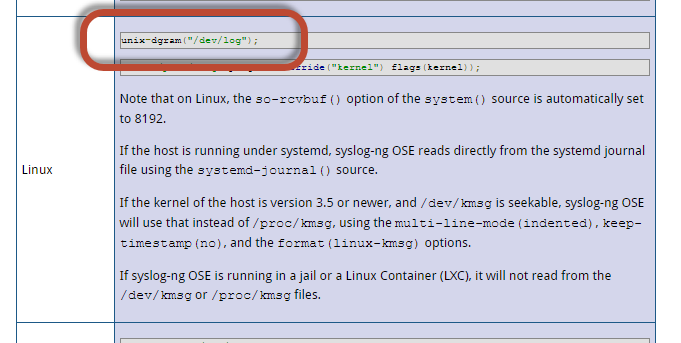 How do I remove the extra information, timestamp and syslog, that syslog prepends the log messages? How do I remove that part? In other words how do I send the record the raw log only? There we go now we are getting just the raw message. I noticed I am getting debug info… which in this case I do not want. I need one more tweak to my file. There we are I filtered out the debug level. Wahoo!